Phragmites, also known as the common reed, is a large perennial grass typically found in temperate and tropical regions. Phragmites were at one point considered an invasive and exotic species in North America, however, recent evidence has shown that the plants are actually native. Phragmites can sometimes be difficult to control. We recommend first trying our Phragmite Control Products and spray these directly onto the plants. The Glyphosate 5.4 herbicide is absorbed into the plants and kills the roots. 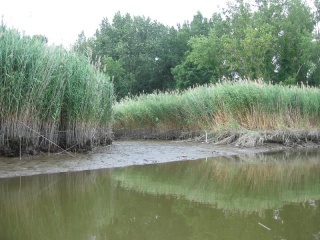 Other methods for Phragmites control include mowing, disking, dredging, flooding, draining, burning, and grazing, but this can sometimes make the problem even worse, as the Phragmite roots are often left intact. The most successful Phragmites control treatments to date have centered around the application of an aquatic herbicide followed by burning of the roots and stalks to prevent regrowth, which can lead to noticeable improvement in pond conditions for indigenous species and migratory birds. It should be noted that this often does not eliminate phragmites forever; further re-treatment is often required in ensuing years.